This is the 10th edition of the 2018 Young Twins Tracker. Notable: Gonsalves lowered his ERA below the 4.00 mark for the first time since May 24, allowing just one run in 11 innings of work this past week. His walks are cause for concern, however, as Gonsalves has tallied five BBs in three of his last five outings. The 23-year-old recorded more walks (22) than strikeouts (21) in the month of June, although his start on Independence Day has him back on track in July (6 K, 1 BB). Notable: Gordon’s batting average dropped roughly 30 points from last week after a rough 3-for-29 stretch, although one of those hits was his first career homer at Triple-A. The 22-year-old’s production took a dip in June, registering a .229/.248/.343 slash line after hitting .302/.333/.395 in 12 games the previous month. Notable: After lighting up Single-A (Low) with Cedar Rapids, Graterol was humbled a bit in his first appearance with Fort Myers. He allowed five runs on nine hits in three innings of work during an 11-3 loss to Lakeland. The Twins’ No. 6 prospect can only improve from here. Notable: Jay was practically flawless in two appearances last week, allowing just one hit in three innings while fanning three and walking none. It was a solid way to end an otherwise deflating month that saw Jay allow eight earned runs in 10 IP (nine appearances). Notable: Another week, another Kirilloff hitting streak. The 20-year-old collected at least one hit in all six games last week, including multiple hits in four contests. With runners in scoring position at Fort Myers, Kirilloff is hitting 9-for-17, good for a .529 average and 12 RBI. Notable: In 23 games in June, Lewis hit .330/.380/.604 with 15 extra-base hits and 22 RBI. A call up to High-A has to be coming soon, right? Notable: Of Rooker’s 10 hits last week, only two were singles. The Twins’ No. 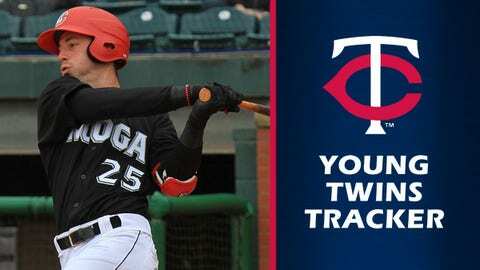 7 prospect leads Chattanooga in doubles, triples, homers and RBI – numbers Minnesota had in mind when it selected him 35th overall in 2017. After hitting .231/.287/.452 in May, Rooker found his stroke in June and finished the month with a .312/.393/.645 slash line with seven doubles, three triples and six homers. Notable: Wade showed incredible patience in June, collecting 17 walks for Triple-A Rochester compared to just 11 strikeouts. His .404 on-base percentage leads Rochester among players with 70+ at-bats. Others: OF Byron Buxton was optioned to Triple-A earlier this week, where the Twins hope he’ll find his hitting stroke again. In six games this week, Buck went 5-for-29 (.172 BA) with three doubles and a homer. … 3B Miguel Sano started four games for Fort Myers last week and tallied multiple hits in three of them. … Rochester LHP Lewis Thorpe, ranked by MLB.com as the Twins’ No. 11 prospect, went 3-1 with a 3.81 ERA in five June starts and was named the Southern League Pitcher of the Week (June 21-July 1) after fanning 19 hitters in two starts. … Cedar Rapids reliever Jovani Moran tallied six Ks in 4 1/3 innings last week and leads the Kernels with 65 on the season.